It was an experiment. We wanted Bert to have a place in the utility room to climb up, out of reach of Callie, and relax a little. He likes to sleep in there rather than in the garage (where his bed is) these days. Sometimes he curls up in a chair, other times he'll sink into the laundry basket to snooze. So I thought one of those cat towers would be a good idea. The cat tower, upholstered in a lovely velour on which a painting of Elvis could be made. The jury is still out. I got a tall tower on purpose. My thinking: the taller, the better for keeping out of the dog's reach. The reality: the taller, the more unstable. It will tip over if you look at it wrong. So I bolted it to the wall. The other reality is that Bert is a big cat and he barely fits on the platforms, and I don't think there's any way he could sit on the very top. But he is using the tower on his own, sort of. I find him perched on the third level many mornings waiting for me to bring his breakfast. The tower, you see (although not from this photo), is right next to the door that goes into the house. So when I open the door, there he is at (almost) eye level. Meow! That title is a riff on the expression trop c'est trop, literally "too much is too much" or "enough is enough." I don't know if it's an expression that's used much, but I did find it online, so it must exist, right? Troo is a town up on the Loir (no "e") River. It sits on a hillside above the river and at the very top of the hill is a little church. From the church yard there are nice views of the valley below. 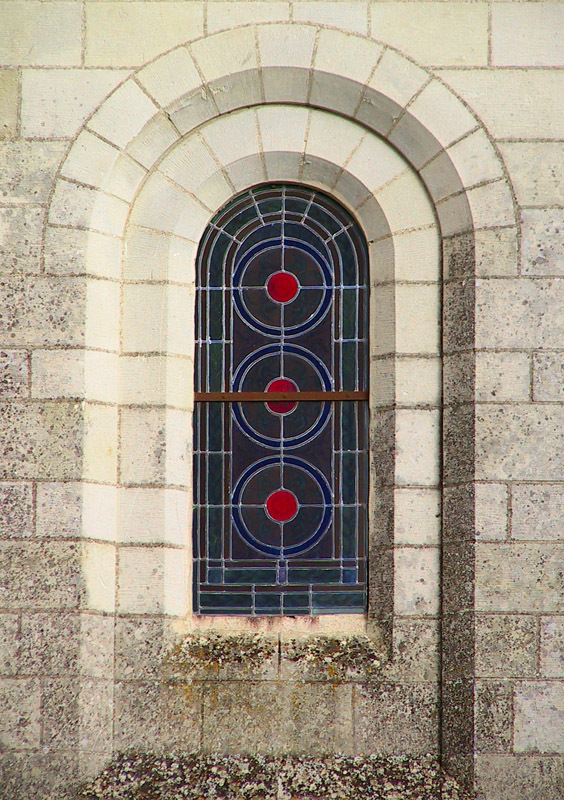 A stained glass window in the church at Troo, from the outside, January 2004. I did something this morning that I almost never do: slept late. I woke up just before 08h00. Normally I get up between six and seven. I don't know why this happened. I went to bed at the normal time, and nothing unusual is going on. I've been sleeping very well lately, too. So now I'm scrambling to get this post done, after feeding the cat (he must have wondered what happened), and now I need to get Callie out for her walk. Have a nice day! Here's another throwback photo. This time we set the WABAC machine to winter 2004. The place is Vendôme, a city of about 17,000 people, the second largest city in our département after Blois. I haven't been there much at all, even though it's roughly an hour's drive from Saint-Aignan. Taken with Ken's Canon PowerShot Pro90 digital camera in 2004. 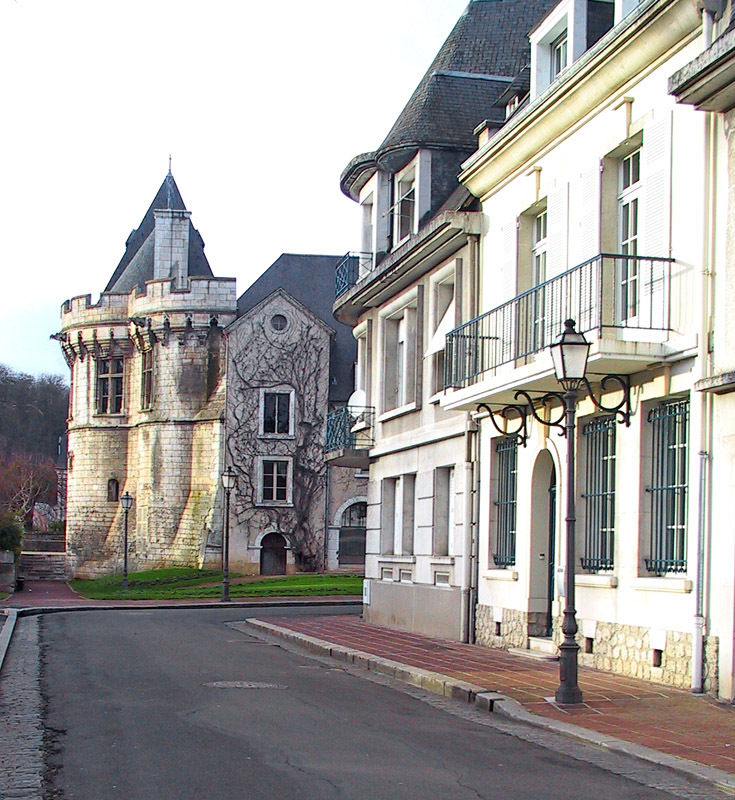 What you see at the end of this street is not really a château, but part of one of the city gates that faces a bridge over the Loir (no "e") River. It's called the Porte Saint-Georges. The gate's origins are in the 14th century, but most of what we see is from the 16th. Vendôme has a picturesque city center and I should go back one day in better weather and explore it. Lest you think I have an incredible memory (which I don't), I did some sleuthing on Google Maps and Google Earth to figure out what this place is. I knew approximately where we were when I took the photo, but I didn't remember what it was until I looked it up. And one of the cool things about digital photography is the meta-data, the fact that the camera records when you took the photo, what settings you used, and what camera you were using. Today's newer digital cameras can even use GPS to record precisely where you took the photo. And maybe what you were wearing at the time. 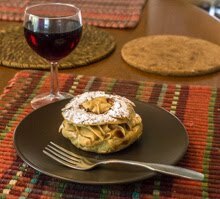 It's been some time since I made mini-muffins, but I had the occasion earlier this week when some friends stopped by for an apéritif before going out to a restaurant for lunch. I made the original recipe years ago with goat cheese and rosemary. 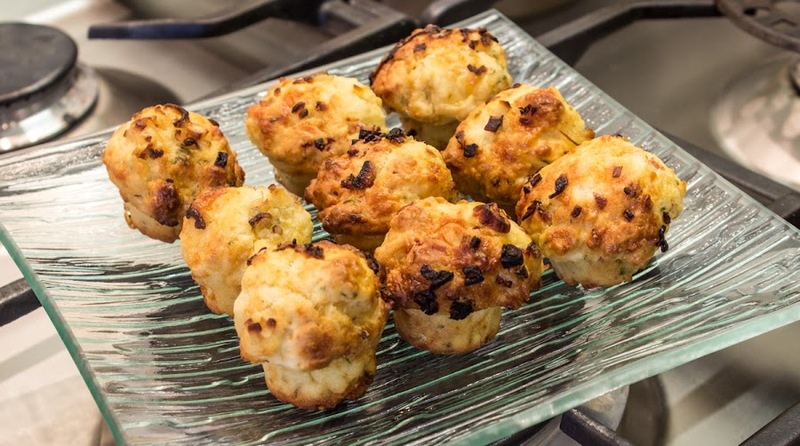 This time I altered it to make ham-and-cheese muffins by replacing the goat cheese with grated comté (a mountain cheese from eastern France) and adding grated lardons (smoked bacon). I also used fresh thyme from the garden rather than rosemary; the thyme plants are covered in fresh fragrant growth right now. A plate of ham-and-cheese mini muffins, nine of thirty, with a slightly burned shallot garnish. I made one gaffe. I carefully minced and sautéed some shallots to incorporate into the batter. After I had combined everything and carefully spooned the mixture into mini muffin molds, I saw the sautéed shallots still sitting on the stove. Oops. Rather than un-mold all the batter to incorporate the forgotten ingredient, I spooned the shallots on top of each muffin as a kind of garnish. It would have worked, except that the shallots very close to burned in the oven. Oh well. The muffins were still good, with just a touch of crispy onion flavor. I served them with a nice dry champagne. 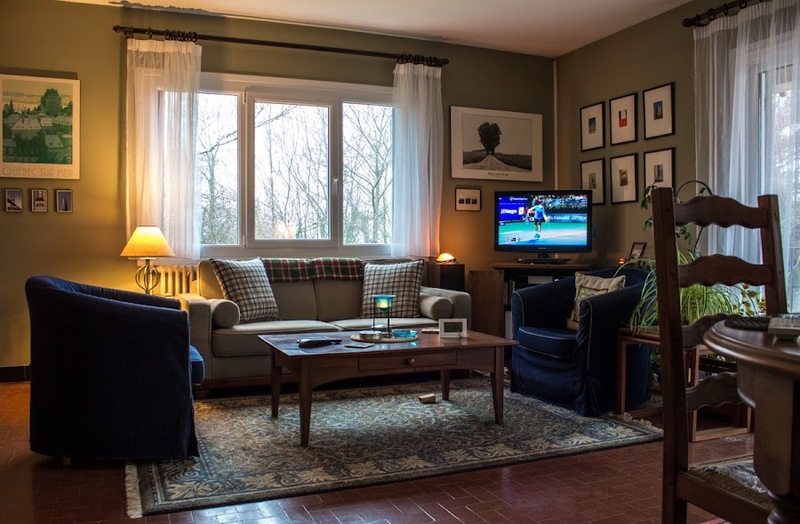 I was watching tennis on television on Wednesday afternoon, around 17h30, and I noticed how gloomy it was outside. It was dark and raining. I had many lights on inside the house and I had lit a couple of candles in the living room. I thought I'd take a picture to memorialize it. Trouble is, you can't tell by the photo how gloomy it felt. It rained steadily most of the day on Wednesday. At least there was no wind, so the rain was vertical. I did have to use the tripod and a long exposure to get enough light for the picture. That's why Novak Djokovic is a little blurry on the television screen. He wouldn't hold still long enough for me to snap the picture. Oh, and he won his match. Before: way out of proportion, and thick with crossing branches. After: more compact and aerated. Yippee! I'm very happy. Not only will the trees no longer shade the vegetable garden in the morning, but there won't be nearly as many apples to pick up off the ground for the next few years. 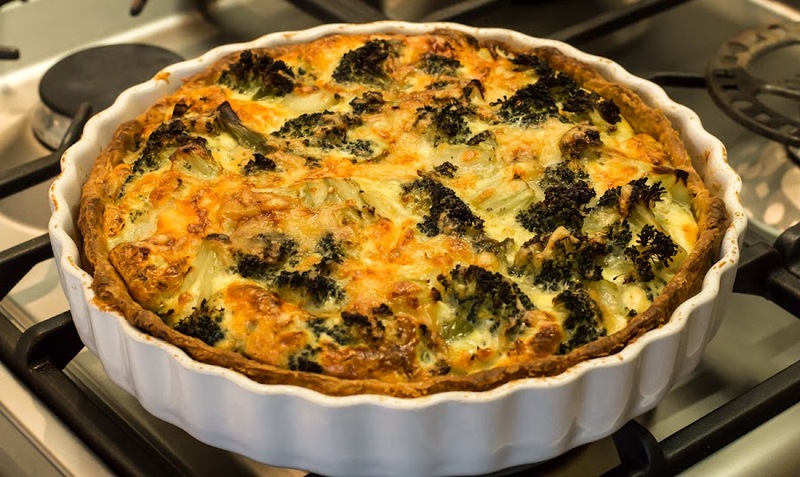 For lack of anything more interesting, I give you yesterday's lunch: broccoli quiche. I saw some beautiful broccoli at the store last week and couldn't resist. I cooked it, had some with lunch one day, and had more than half of it left over. It occurred to me that a quiche would be a good way to use it up, and it was. I threw together a crust, whipped up some eggs and cream, grated a little cheese, and voilà. Now I have a lot of left-over quiche. I forgot to sauté a little onion for the quiche. That would have made it even better. I ate a little less than a quarter of the quiche with green salad for lunch on Monday. Today I'll have it again, but this time with French fries, I think. Pour varier les plaisirs. Just to change it up a little bit. 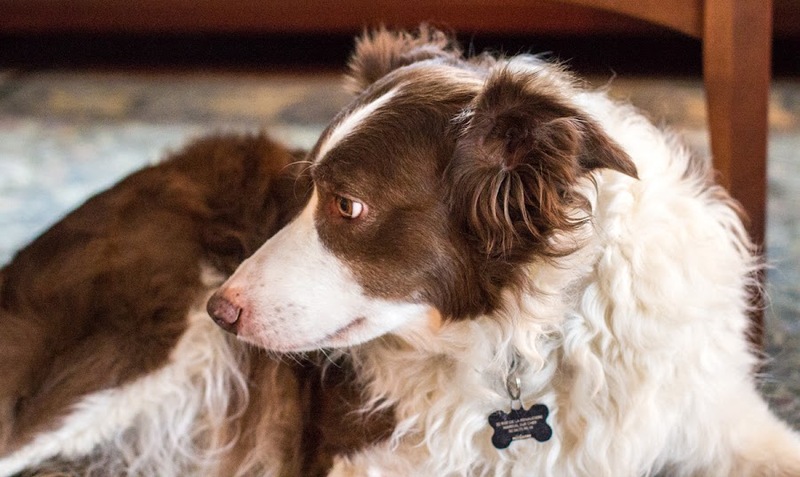 Today is Callie's ninth birthday. So, in dog years, she's older than me now. I'm amazed that it's been nine years already. Wasn't she just a puppy? Just two days ago someone we met on our walk asked how old she was. He was surprised to hear me say nine. She doesn't look it, he said. Callie lounging on the living room carpet. I wish I had thought to turn her tag around so her name showed. Her hair is a little long now and it's a mess from walking out in the rain and mud. She gets showered down and towel-dried every day to remove the sand and mud from her legs and belly, but I'm not good at keeping her fur untangled. We have an appointment at the groomers on March 1. It can't come soon enough for me. She'll get a good shampoo all over and the long hair on her legs and feet will be trimmed down. I'm looking forward to drier days. At one point, she noticed the birds feeding out on the deck. I don't have anything special planned for her birthday. Maybe I'll make her a scrambled egg; she likes those. She'll be happy with her two daily walks, treats, and snoozes. I took this photo back in 2004 with one of Ken's digital cameras, a Kodak DC4800 pocket model. 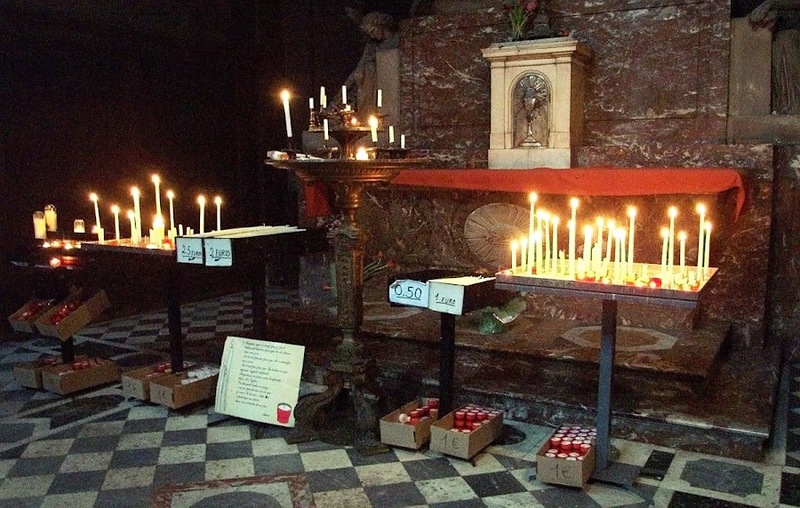 It's taken inside the church of Saint Sulpice in Paris, very near to where I lived as a student in 1981. I've messed with the image a little in an attempt to reduce the noise that often shows up in low-light photos. The camera was totally automatic, or at least I was using it in automatic mode. One of my first forays into digital photography, February 2004. We're back in the blah weather cycle. A very fine rain, which the French call bruine, fell all day Saturday. It was driven by gusty winds and was not very pleasant to be out walking in. Even Callie doesn't like the rain driven into her eyes, but she's a trooper. At least we had the wind at our backs on the way back home. And a fire in the wood stove most of the day. 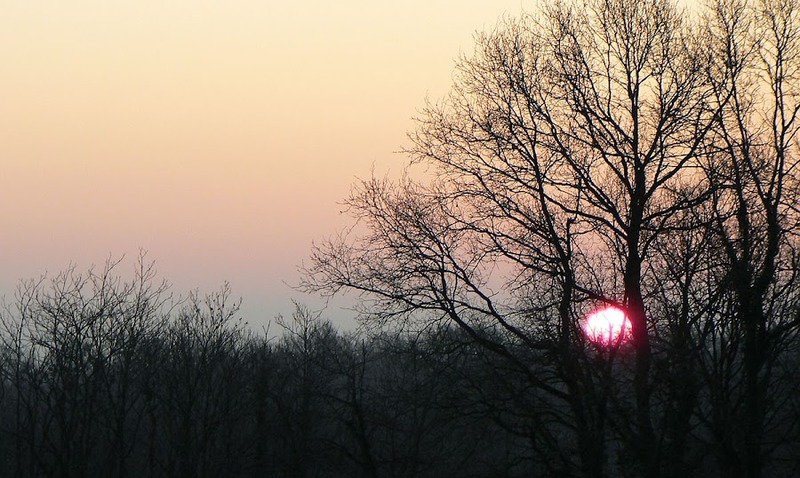 The last of the snow melted away on Friday as the temperature warmed up. I wonder if that was winter's last gasp or whether there will be more. Time will tell. As February starts to transition into March, there should be some very nice days sprinkled in between the chilly, rainy days. 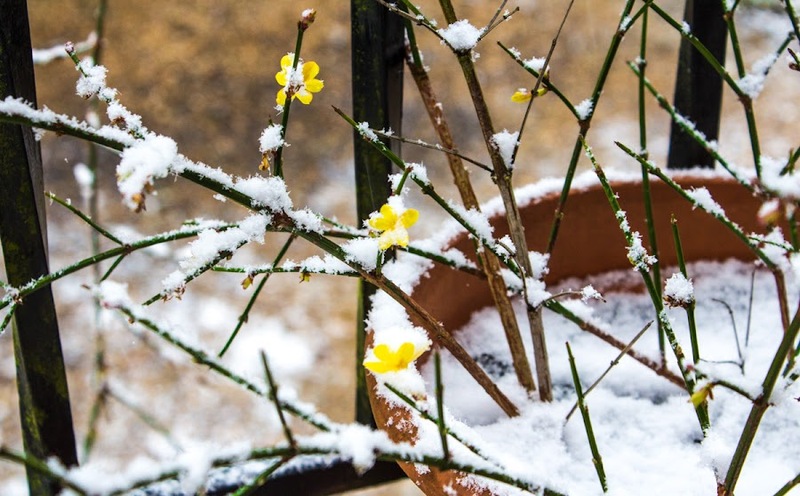 Snow on the winter jasmine. I'm slowly getting some chores done around the house while Ken's away. Nothing monumental, but there's some cleaning and organizing that needs to be done, kind of like a pre-spring cleaning. There's also laundry. And a trip to the déchetterie (dump) and recycling center is in my immediate future. Not to mention the care and feeding to the two animules. Callie goes to the groomer soon. And you thought my life was all fine wine and foie gras. Thursday was a beautiful day, at least during the morning hours. Snow had started to fall before it got light outside and was sticking to the ground in the colder spots. Patches of ground stayed bare, especially under the trees. 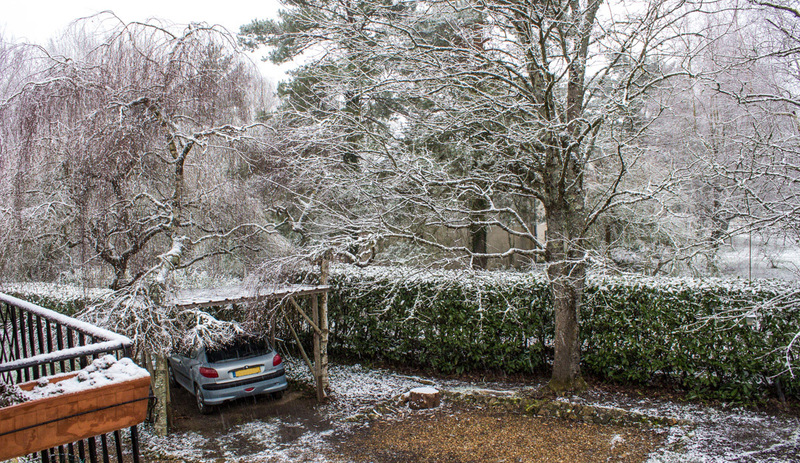 The snow continued, unexpectedly, all through the morning before changing over to rain in the early afternoon. Then it changed back to snow for a little while, but by then most of our 1-2 centimeter accumulation had melted away. Taken around 10h00. A thin layer of snow covers cold spots and branches, but the driveway under the tree stayed clear. I took a few photos from the deck and out the windows. I didn't want to get the camera wet by taking it all the way outside. It was just barely freezing and the snow was wet and heavy. It's mostly all gone now, but the snow was pretty while it lasted. We're expecting a warm-up this weekend. It's nice to be able to feel the days lengthening. We gain a few minutes of daylight every day now. And our temperatures seem to be more normal now with morning frosts and chilly days. I've been burning a lot in the wood stove these past few days. This morning they're telling us to expect snow showers, changing over to rain as the day goes on. Then we'll warm up again over the weekend. Although this shot was taken in February 2010, the scene looks pretty much the same right now. I stopped into the grooming salon yesterday while I was out and about to make an appointment for Callie. The groomer is busy! The first available appointment is March 1. Normally I get an appointment within a few days. She (the groomer) also told me that she's moving her shop from the center of our little town out to a new place that she's having built out on the outskirts. She will then have the space to board dogs and cats in addition to the grooming service. I think it's great that she's doing well, but I'm also sorry that our little village center will be losing another business. I wonder if something else will move into her shop? This photo is from February 2009. You can tell it's not recent because the old electrical poles and wires are still visible. They've been gone for a while now and, I can tell you, I don't miss them. 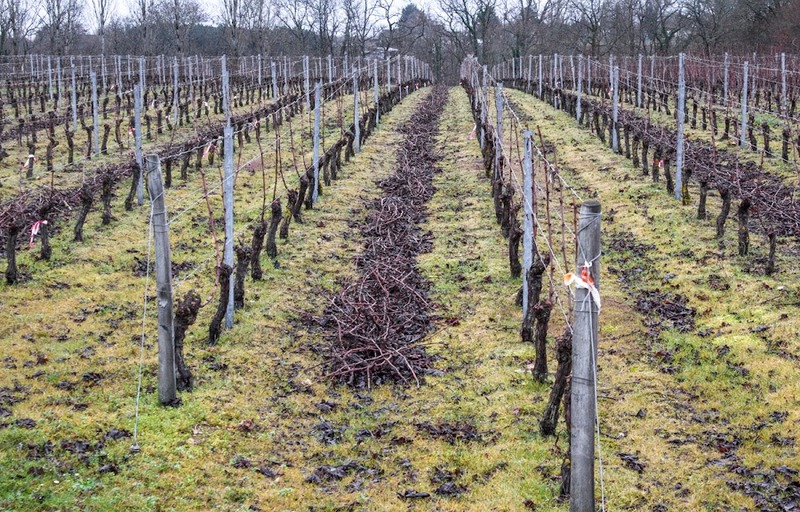 Pruning is in full swing out in the vineyards now in preparation for spring. Looking to the northeast, across the vines to our hamlet, then across the river valley. I just got a message from Ken that he has arrived safe and sound, if not a bit tired, in North Carolina. He's been up for nearly 24 hours, so I'll bet he's ready for bed. As for me, I've got some errands to run this morning. And it's another freezing morning, so that's good for the growers. When I passed one of the guys in the vineyard early yesterday morning, it was quite nippy out. He smiled and said, "Feels good, eh?" In French, of course. I'm continuing with my little "flashback" series for now. At least until I feel like getting the camera out. If it isn't raining or windy, it's darned cold. Normally, the cold doesn't bother me for photography; depends on the day. 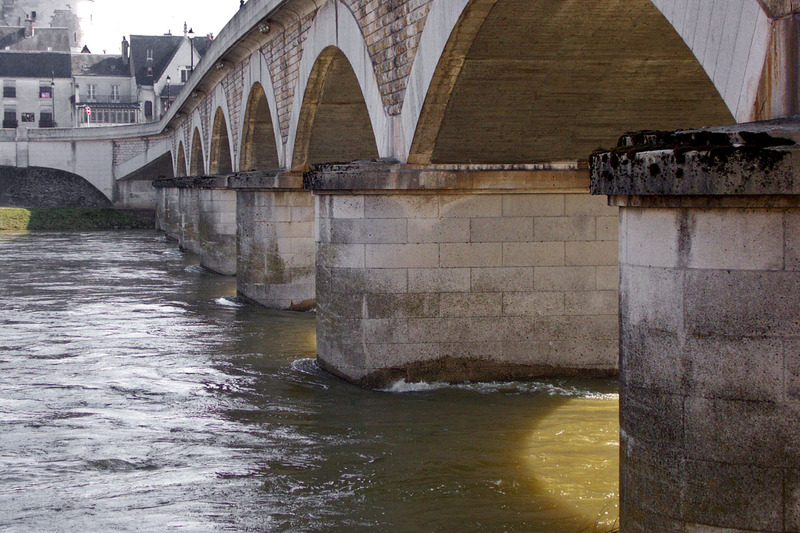 This is the Loire river passing under the Général Leclerc bridge at Amboise. La Loire at Amboise, March 2006. Ken got to his train on time and made it to Paris, where he spent the night before today's flight to the states. It's much less stressful to get up there the night before than to have to scramble for an early morning train to the airport. Normally things work out fine, but you never know if there will be a problem that delays the train, and you don't want to take a chance on missing your flight. That nearly happened to me in 2005. I was taking the train from Tours to Lille and then through the Channel Tunnel to London for a flight out of Heathrow, and there was catenary problem down near Bordeaux that delayed all the trains on that route that day. I was re-routed through Paris (my original plan avoided Paris) and had to schlep my luggage across town on the subway before getting on the Eurostar train at the Gare du Nord. Fortunately, I was spending the night in London before flying the next day, so I didn't have the added stress of worrying about missing my plane. Lesson learned. The storms are over for the time being. Now we're going to have relatively clear skies and colder temperatures for a few days. This photo is from March 2008 when we experienced the standard giboulées de mars in March. More and more they seem to be happening in February. I think of them as kind of like March winds and April showers combined. Sunny intervals in between rain squalls, March 2008. Ken's on his way to Paris today, then flying out to the states on Tuesday. I'm staying behind with Callie and Bert. We're keeping our fingers crossed for good flying weather. Or, in French, une flaque d'eau. 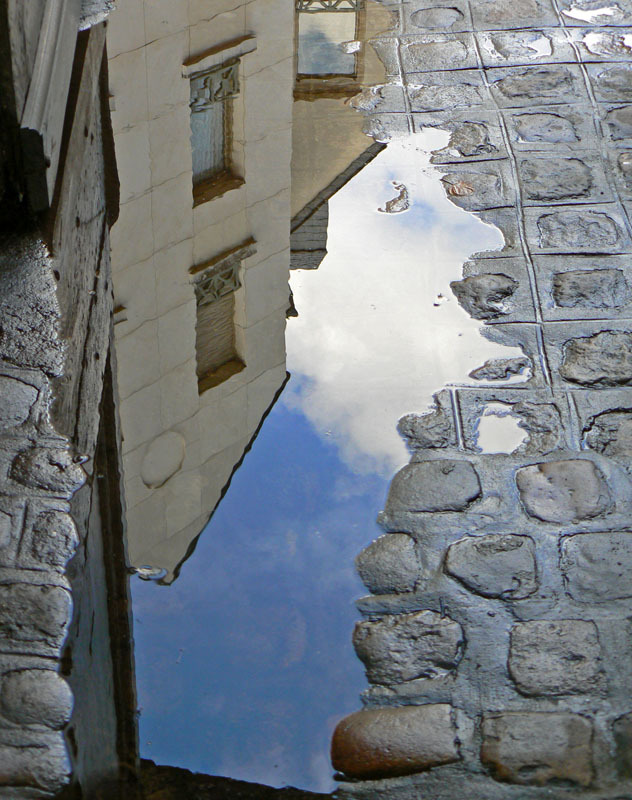 It may be hard to see, but this is a building reflected in a puddle of water on a cobbled street. 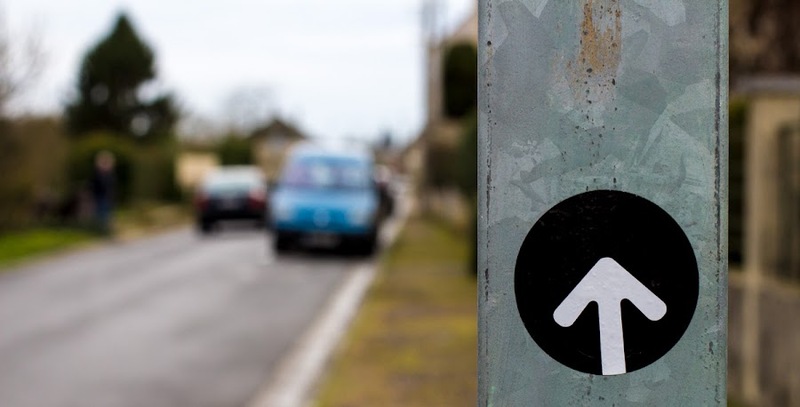 The street is in Normandy, but you probably can't tell that from looking at the picture. It's another photo from back in 2006, in case you're wondering. Look! Blue sky in Normandy! 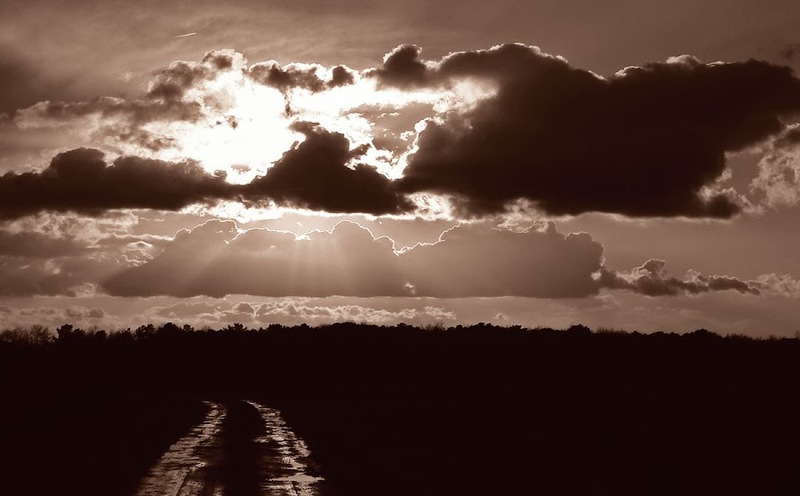 The storm we had on Saturday was nowhere near as bad as predicted. Granted, we were predicted to be on the edge of what was supposed to be a high-wind event. The edge stayed away to our west. We had gusty winds, but not anything too scary. Thank goodness! Another old photo from the archives. I took this one in 2006 in the Dordogne region of southwestern France. The camera was my first digital: a Panasonic Lumix bridge camera. I liked it a lot and took some cool pictures with it. But I wanted more. I stopped using the Lumix in 2012 when I got the Canon that I'm using now. Soon after getting the Canon, I moved into total manual photography, trying to learn the ins and outs of aperture, shutter speed, and the other manual controls. It hasn't been easy, but it's been rewarding. 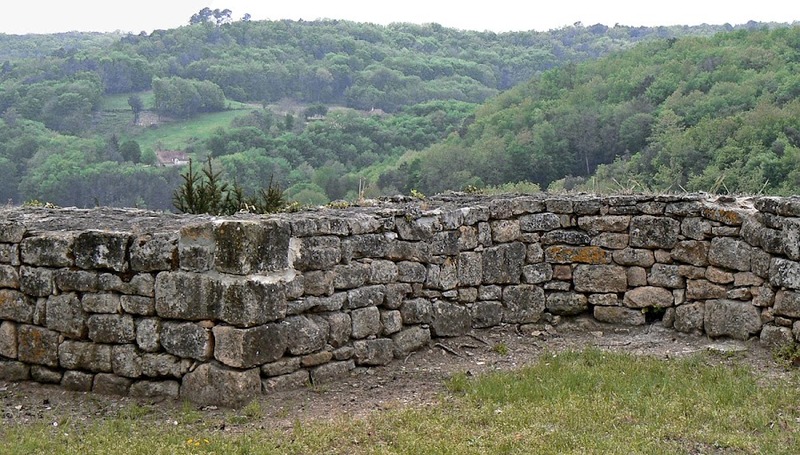 A stone wall in the Dordogne, April 2006. Taken in with the Lumix camera in .jpg format, now reprocessed with Photoshop 13. 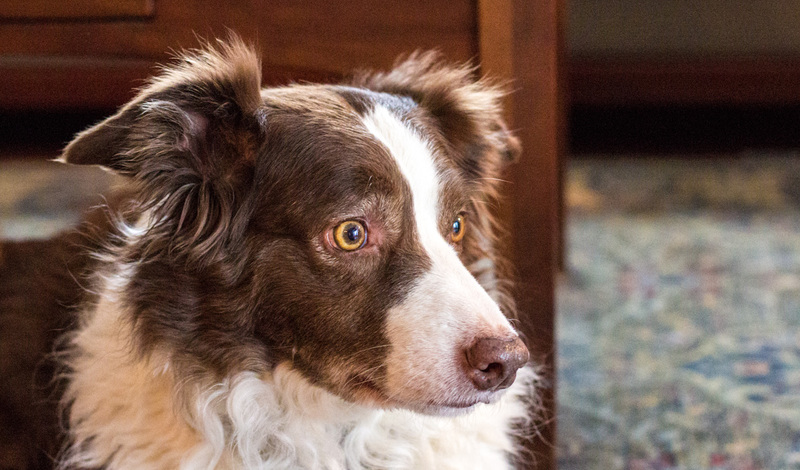 Since moving into manual mode, I've more or less abandoned the .jpg format in favor of raw images. I still save to .jpg for publishing, but not until I've done the post-processing of the raw image. I'm far from being good at it, but I'm trying to improve. When I first got into photography back in the late '80s, I was using 35mm slide film and trying to learn priority modes (aperture vs. shutter) without ever really going into full manual. And since then, post-processing software (like Photoshop and Lightroom) has really changed the way I look at photos. So here I am, nearly thirty years later, film long gone in favor of digital, still trying to learn and improve. Life is a cabernet, ol' chum. I've been enjoying looking back at photos from a few years ago. This is one of the first that I took with my "new" camera, which will be four years old soon. I think I used the photo as an "Image of the Week" back in 2012, but otherwise you haven't seen it. 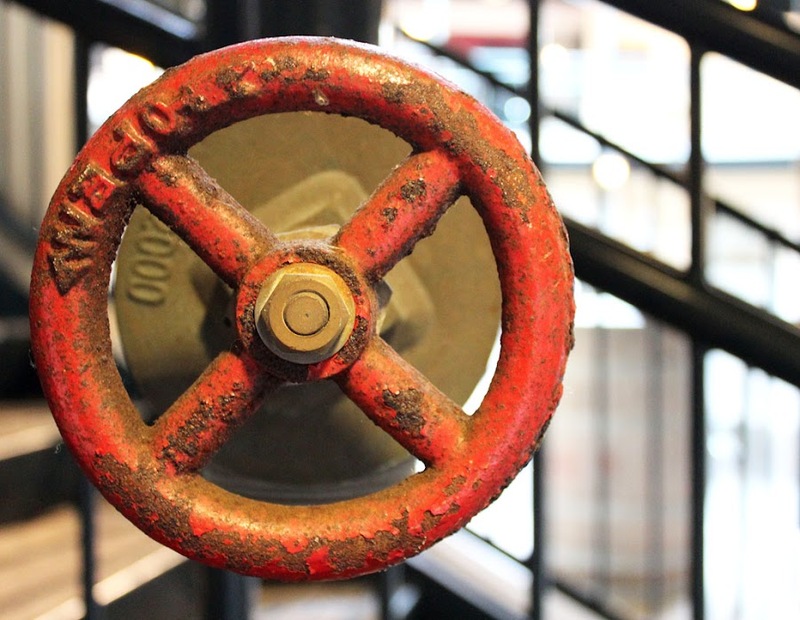 A valve on what I assume is a fire safety system in a building in Provincetown, Massachusetts, 2012. I'm considering investing in another new camera. I'm only at the research stage at this point, but there are a couple of upgrade models I'm interested in, still in the Canon DSLR line. I want to have the flexibility to use my current lenses on a new camera and not have to replace them. I've taken to eating an apple a day. I did the same thing last winter, but at some point I stopped. It's during the winter season that I find this specific apple in the supermarket. It's called Tentation Delblush, a French cultivar created in 1979 that is a cross between the Grifer and Golden Delicious varieties. I've never really liked Golden Delicious apples, but the Delblush variety is much sweeter and every bit as crunchy. I read that they're grown commercially in New Zealand (and some in the UK) then shipped to the Northern Hemisphere where they're available from fall until spring, but the ones I buy are marked as having been grown here in France. 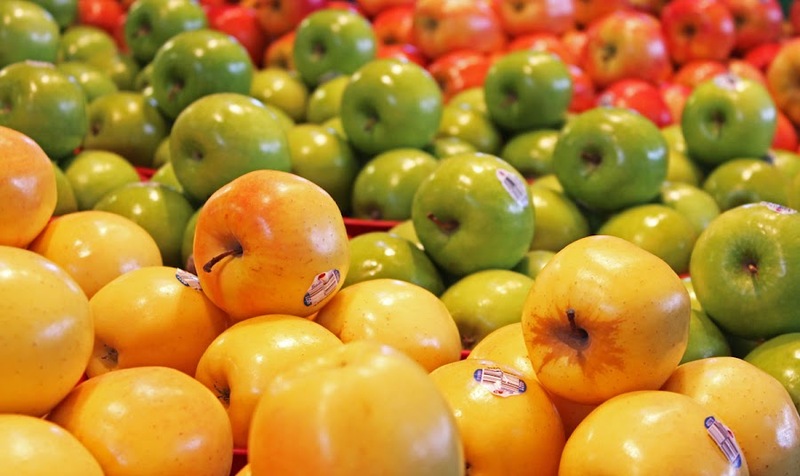 Delblush look similar to the yellow apples in this photo (which I took at the Marché Jean Talon in Montréal in 2012). I eat my apple in the evening with a piece of cheese, often a firm brebis (sheep's cheese). Very tasty and nutritious! I'll miss the Delblush when they're gone, but they'll come back again next fall. 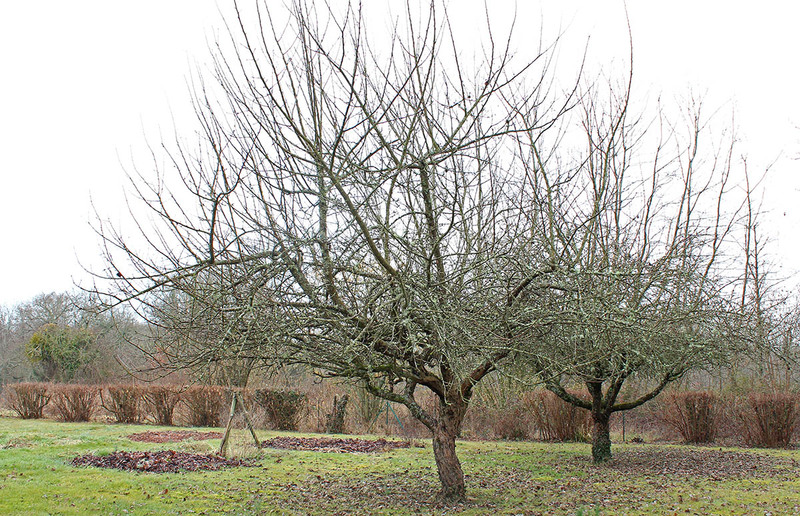 In the meantime, there are many other apple varieties from which to choose, not to mention the ones that grow in our back yard. Here's an image from late summer. In 2003. It was our first year here and we were out and about a lot exploring. 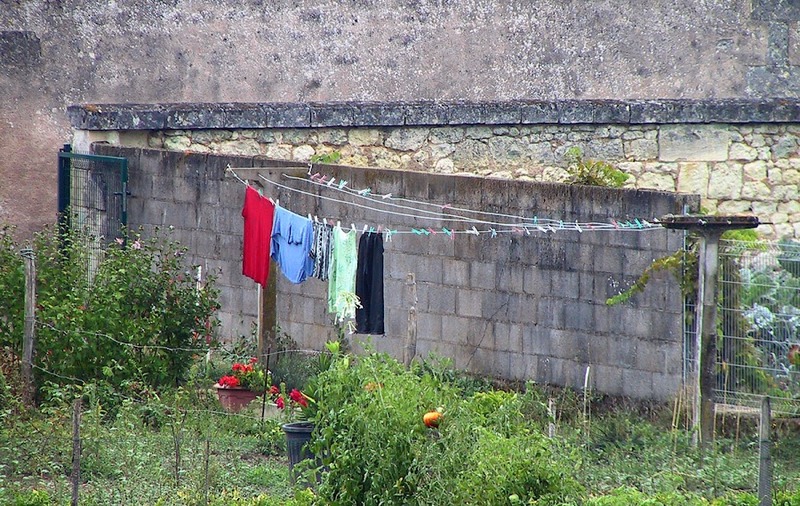 This is part of someone's backyard vegetable and flower garden and their clothesline. It's in a town not far from here. I wonder, if I could find the spot again, what it looks like now? An image from warmer and drier days. What I'm looking forward to is getting out of our current winter weather pattern: successive rain squalls with strong wind. 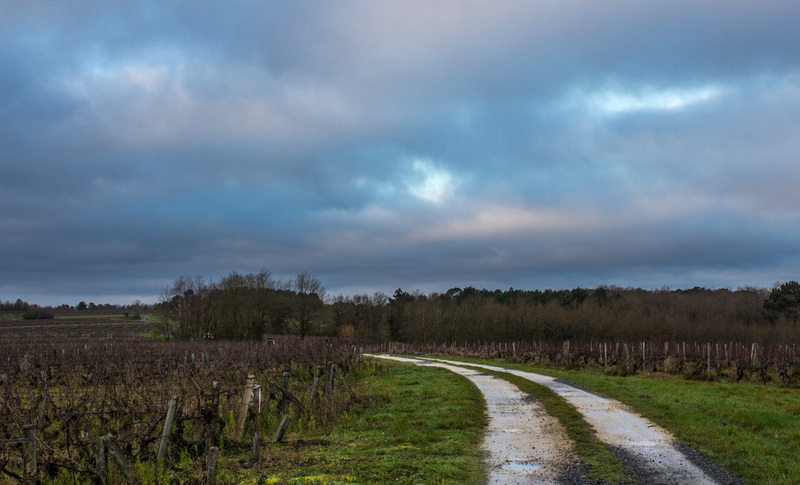 It seems to be the typical giboulées de mars (march showers), only it's happening in February. At any rate, we get a little reprieve today. The wind has died down, if only temporarily, and we expect a sunny, albeit chilly, day. The stars are amazingly bright early this morning. 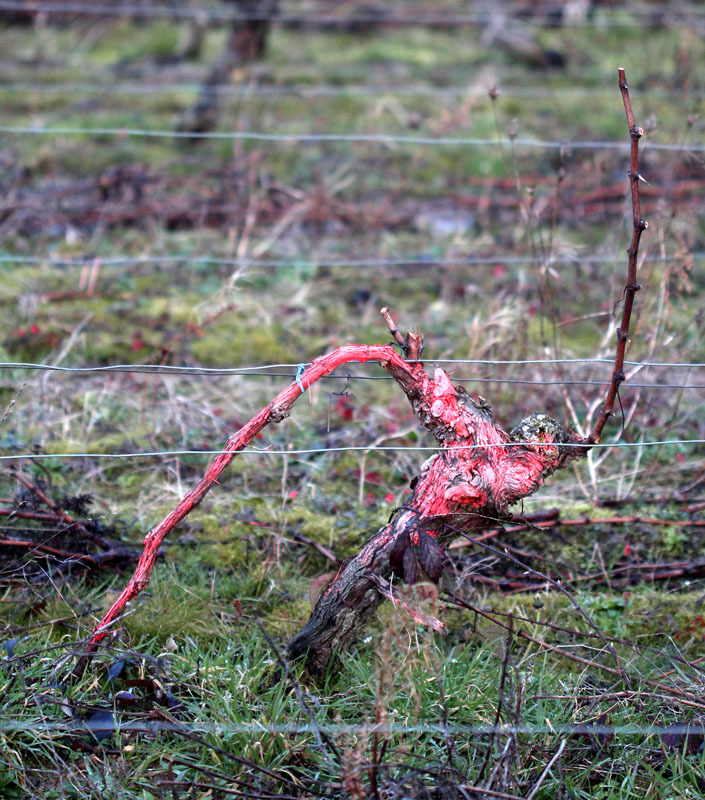 More and more vineyard parcels are looking like this as the annual winter pruning continues. In some cases, it's a one-person operation. He or she cuts and stacks the trimmings as you see here. In other cases, one crew will go through and make the cuts, then another crew (or person) will pass through to remove and stack the trimmings. It all depends on the grower. Some growers used to burn the trimmings as they cut them, but I haven't seen that done around here in several years. After the tractor passes, the mulch will stay on the ground and decompose, providing nutrients to the soil. Later, someone will drive a tractor along the rows with a mulching attachment and grind the trimmings. That's when you know that spring is here. I feel like I'm scraping the bottom of the barrel for photos right now. The weather has not been good for outdoor photography; I don't like to take the camera out in the rain. And sends the clouds a-flyin'. We're on the southern edge of a storm that's blowing across the north from Iceland to the British Isles. The wind has been whipping around out there all night, and is expected to continue through to Tuesday. We certainly will not be getting the worst of it, but strong gusts still make me nervous. The clouds were already a-flyin' on Sunday morning. Monday macros saw its shadow last week and dove away underground. I expect it to show up again any day now, once the wind dies down. In the meantime, you can paint your wagon. With all of the rain we've had in January, the pond outside our back gate is overflowing. 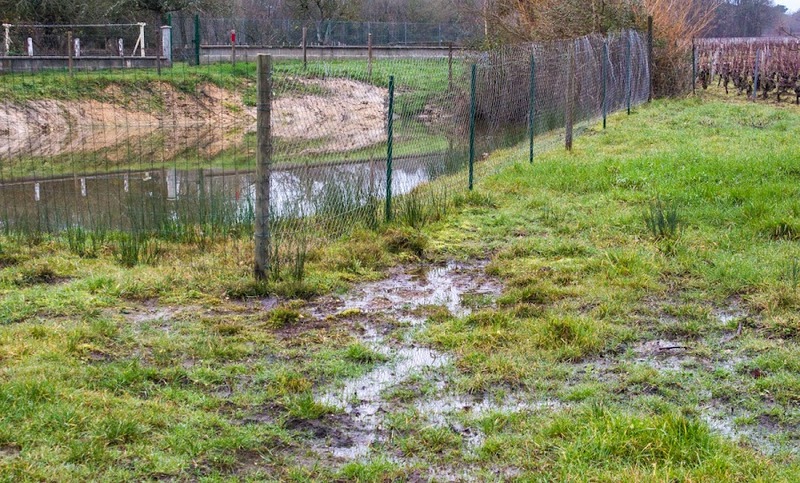 Water seeps over the lowest spot, closest to the gate, and runs downhill (of course) along the tractor path between vine parcels until it gets to a drain which, I presume, channels the water through a pipe down into the adjacent ravine. From there it heads toward the river. Overflow from the pond makes for some soggy ground. Needless to say, the ground outside our back gate is soggy. When cars and trucks use this spot to turn around, their tires sink into the mud and leave serious ruts. It ain't pretty, but there's not much to be done about it. We live in the country, after all. The rain shows no signs of letting up in the coming week; one system after another is predicted to bring us more water and wind. 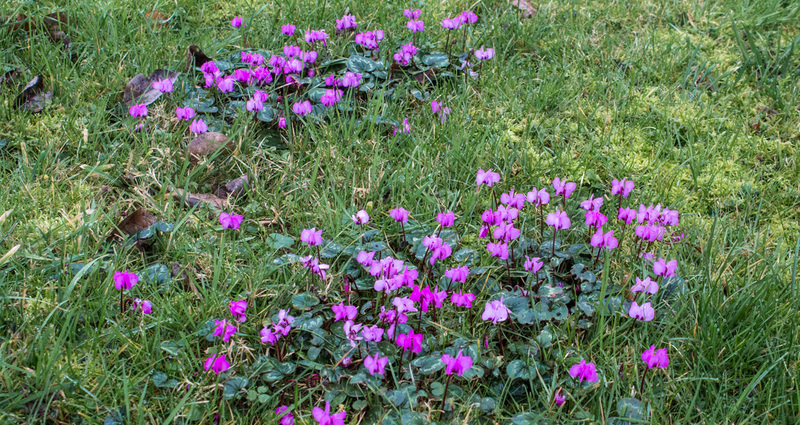 The cyclamen are in full bloom in our grass right now. The primroses won't be far behind, unless we have a freeze. But that seems unlikely in the foreseeable future. 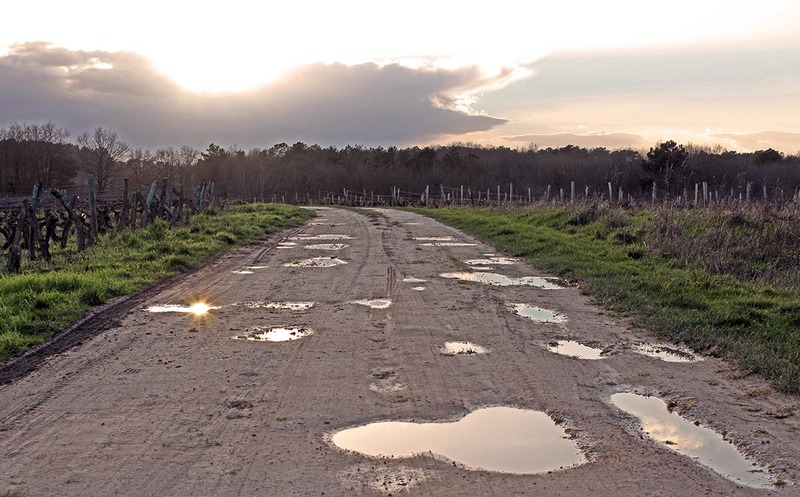 I talked to one of the grape growers out in the vineyard yesterday and he was shaking his head about the fact that we haven't had any freezes. Just a few mornings at -1ºC or colder, he said, would be all we'd need. I don't know if that's about killing pests or putting the vines into dormancy or what. Maybe it's a little of both. Little groups of cyclamen come up here and there in the grass. Soon I will be outside making things ready for spring. Some low shrubs need to be trimmed back, old flower beds need to be cleaned up, etc. 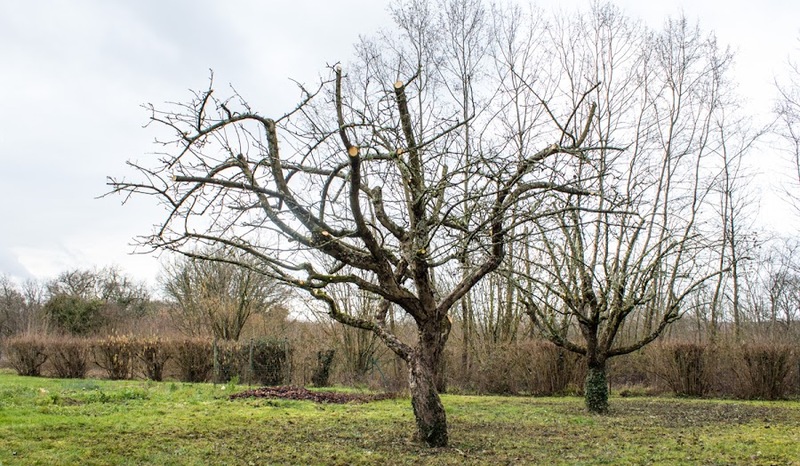 I'm still waiting for the garden crew to come and prune back two apple trees. They flaked out on me last year, for which they apologized profusely. This year they said they'd come at the end of January. I guess I forgot to ask them which year. 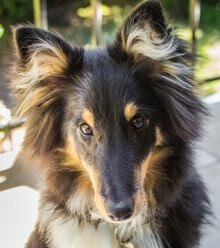 I've tried a new (different) card in my camera and it seems to be working just fine. We tried many things to rescue the old card, but nothing works (and thanks for your suggestions), so I guess it's just one of those things. Since I don't yet have any new photos to share, here's a rerun from February 2013. It kind of looks like now, weather-wise, and the ground is just as wet. The fur on Callie's legs and belly gets wet, then the mud from the road sticks to it. I took some photos on my morning walk on Wednesday. This morning, when I attempted to move them from the SD card in the camera to the computer, my computer would not read or even find the SD card. The computer reads other cards just fine. No computer in the house will read the affected SD card. The camera will not read it, either, nor will it format the card. It seems to have just died. This is the first time I've had a card that just became unreadable. I have no idea what happened, but I do know that those photos are gone. So today you get a shot from last year. We enjoyed our annual meal of crêpes on Tuesday. It all worked out rather well, and both the savory and sweet crêpes were delicious. I made both batters in the morning and allowed them to sit in the 'fridge for a couple of hours. For the savory crêpes, I used sarrasin (buckwheat flour), a couple of eggs, a little vegetable oil, salt, and water. 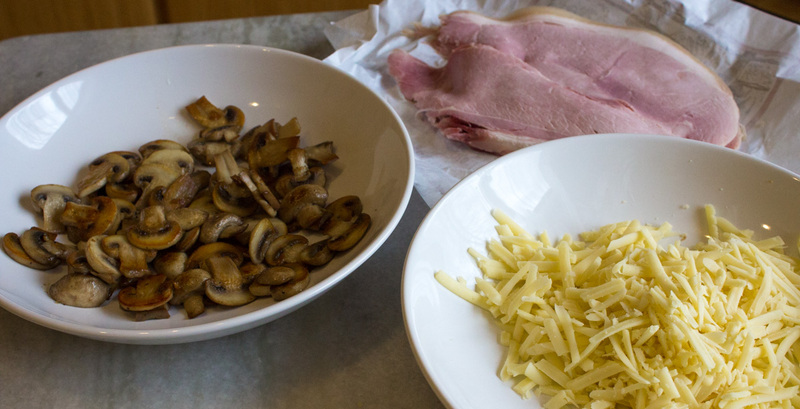 Ingredients for stuffing savory crêpes: sauteed mushrooms, ham slices, and grated cheese. I made the savory crêpes in the larger of our crêpe pans and held them warm by wrapping them in a towel. In the meantime, Ken grated cheese and I sauteed some mushrooms. 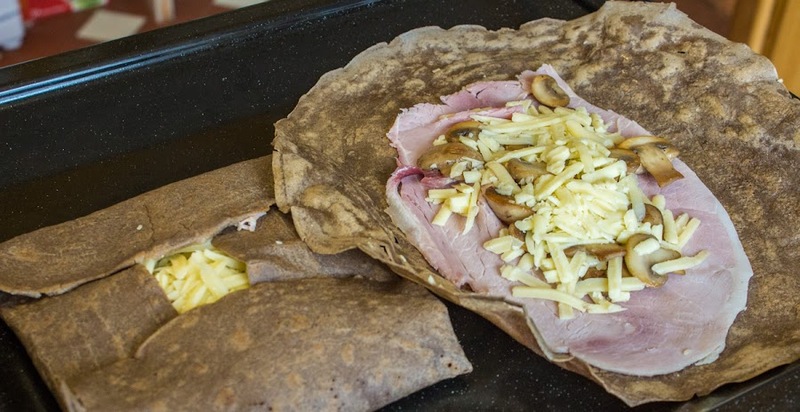 Then we stuffed each crêpe with a slice of ham, some of the mushrooms, and the cheese before folding them up into little envelopes and putting them into the oven until the cheese melted. Stuffing and folding the crêpes. We each ate two of them, followed by a nice green salad. Very tasty and very filling! We saved the sweet crêpes for later in the evening. That batter was very similar, except that I used all-purpose flour and milk, and I made the crêpes in the smaller pan. We filled some of those with jelly and some others with triple sec and sauteed them in a little butter before eating them. I should make crêpes more often. They're easy to do, once you get the hang of it. One thing I've learned over the years is to be patient and let each crêpe cook thoroughly before trying to turn it over. It should release from the pan easily and slide around before any attempt to flip it. And flip it I do, up into the air and back into the pan. It's quite fun. Well, that title might have worked better if Steven Tyler lived in this direction. As it is, it's Mick Jagger who owns a house not far from this little arrow. Apparently Mr. Jagger spends enough time at his Loire Valley manor house outside of Amboise that people we know have seen him out and about. We never have. I have no idea what this sticker means. Maybe it marks a hiking route through town? I'll be making crêpes for lunch today. 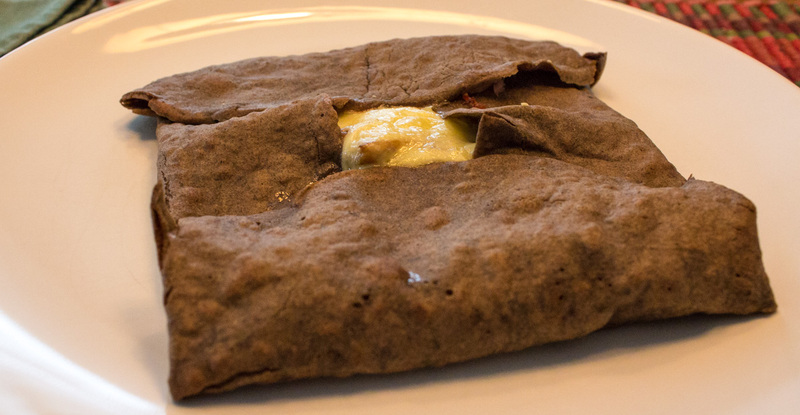 They will be traditional Breton buckwheat crêpes, filled with ham, mushrooms, and a cheese sauce. Then we'll have sweet crêpes for dessert. I'm already hungry. I've been having fires on and off this season. Mostly on, but there have been warm days when building a fire just didn't seem necessary. It's unusual for this time of year not to have to build a fire in the wood stove every day. In addition to the relatively warm weather, our new boiler's thermostatic control makes it so much easier to let the central heat keep the house at an even temperature. Before, the heat was either full-on or full-off, so on warmer days it was either too much heat or not enough. Now, the thermostat keeps things comfortable. 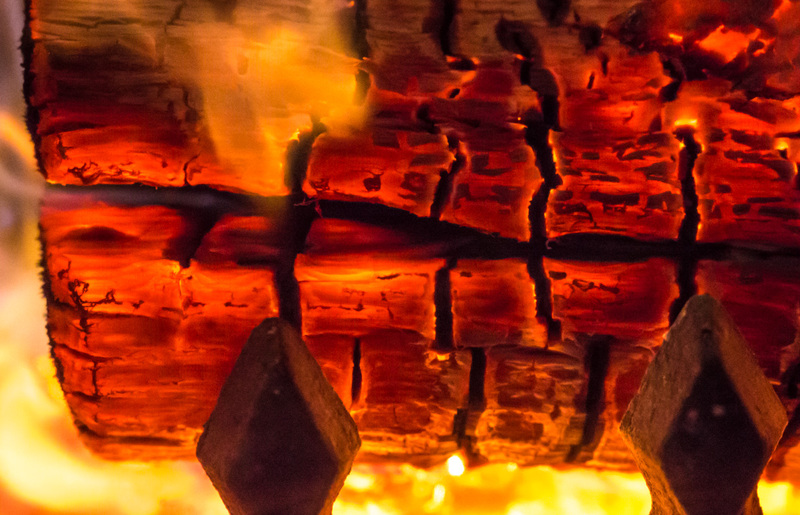 A log burning inside our wood stove, 100mm (macro), f/5, 1/250s, IS) 6400. The men's final in Melbourne went pretty much as expected. Murray couldn't even win a set against Djokovic. Oh well. The season's just begun.